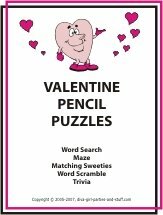 For a FREE Printable Valentine Games Mini Pencil Puzzle Ebook tell us about the most romantic Valentine gift you have ever given or received. Just visit our Valentine Trivia page, scroll to the bottom and fill in the form. When you want your Valentine party games to have a professional look and feel, these games are the perfect solution. 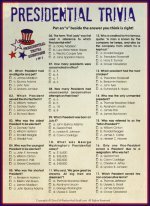 Valentine quizzes and the interactive right left Valentine game will add fun and lively conversation to your party. Buy one game or get them all for less than the price of three. NEW GAMES are added on an ongoing basis. Contact us if you have a particular game you are looking for.